Last night we fell asleep to the sound of rain and today we woke up to lower temperatures and more rain. I'm a big time lover of heat and sunshine but I'm also thankful for a cool breeze once in a while. Today we're wearing pants and long sleeve shirts, trust me that's saying a lot for where we live. So for breakfast we had warm pancakes with hot caramel sauce, it was the perfect way to start our coldy day. 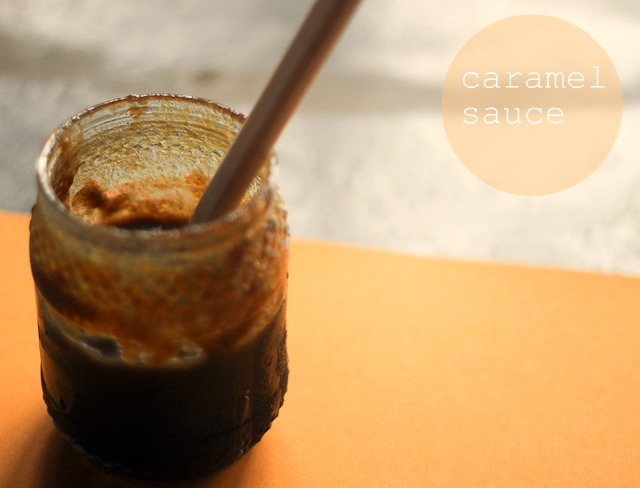 This caramel sauce is a variation of this buttermilk caramel sauce, the one I mentioned to you last week, the one I really wanted to try. Well, I tried it out, made a few tweaks, and now we have plenty of caramel sauce, and as you can guess no one is complaining. This sauce is sweet, but not tooth-achingly sweet. It has a nice vanilla depth to it and a creamy, almost frothy texture. Enzo likes it when I drizzle it on warm Frech bread. I'm thinking it would be awesome with donut waffles and probably even more awesome with some some pumpkin spice pull apart bread. You can dip apples into it, or pour it over some vanilla ice cream. Better yet use those apples to make an apple pie, then put a big scoop of vanilla ice cream on top of a generous slice, and then top it with homemade caramel sauce. Really, the possibilities are endless. In a large sauce pan add the milk and the vinegar and let it stand for a minute. Then add the white and the brown sugar and the butter and mix over medium heat until it starts to boil. Remove from heat and whisk in the baking soda and the vanilla. It will start to bubble up a lot, this is totally normal because of the baking soda. Let the sauce cool down to room temperature before using it.